Recently found in Arizona, it has been given the name Azumar, from azure (blue) and mare (ocean). Its color reminds us of the stunning turquoise shades found in tropical seas, and its energies are definitely evocative of the Water element. In Roberts words... “Azumar is a powerful stone in the realm of feeling. Its currents wash through the Liquid Crystal Body Matrix, bringing refreshment, joy and rejuvenation to every cell. It is a wonderful stone for healing and brightening the emotional body--effortlessly dissolving negative fixations within its peaceful waves of pleasure and power. It can aid in dispelling anger, envy, fear and stress, replacing them with serenity, enthusiasm, confidence and the feeling of being enveloped within an atmosphere of love. As Azumar does its work of transformation within the waters of our liquid crystal structures, dysfunctional patterns dissolve and we are filled with the joy that underlies all life. We are made clear, like a flowing spring, and this clarification of consciousness gives rise to untapped intuitive potentials. We can suddenly begin to develop clairvoyance, telepathic sensitivity, and the capacity for enhanced visionary awareness. Those who are readers of oracles may find their senses heightened and their ability to see future events increased. Those who are channels or mediums will find that their attunement to Spirit is easier and deeper. And all of those who work with Azumar will experience its powerful influx of pleasure, power and joy. Under Azumar’s influence, one’s awareness can rise to the highest possible perspective, while still penetrating to the intimate depths of whatever is the focus of one’s attention. This is one of the most powerful stones I have encountered for personal evolution and the enhancement of consciousness. I have the sense that these stones could be helpful to those experiencing depression or insomnia, or who are bothered by nightmares. Experiencing such happiness in the sleep state was a new phenomenon for me. “Azumar is an ideal companion for Healerite, and the two work together marvelously for bringing energetic wholeness and well being to one’s body and vibrational fields. It harmonizes with all Azeztulites, especially the Azozeo Super-Activated Azeztulites. It also works well in combination with Arkansas Golden Healer crystals, Lemurian Light crystals, Sugilite, Moldavite, Aquamarine, Azurite, Larimar and Lithium Light. Rathbunite stimulates the exuberant, fun-loving side of Azumar. 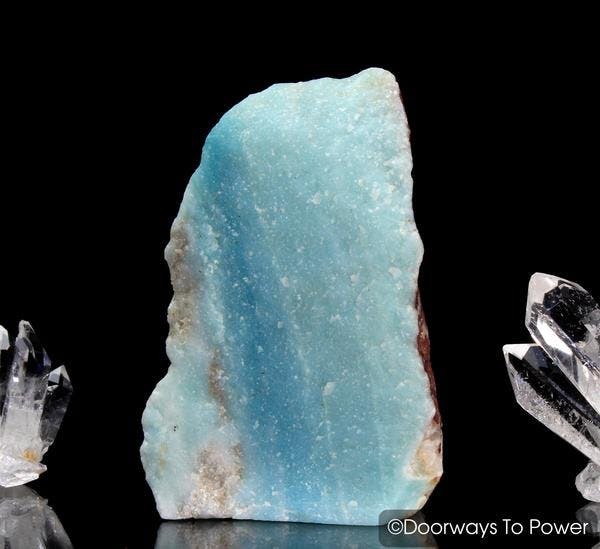 Phenacite, Herderite, Danburite and Petalite all enhance the experience of expanded spiritual awareness which Azumar can bring to us. Thank you, Shilona. Also received the Azumar today. A sweet, beautiful piece. Thank you also for your lovely gift. The aqua color of both pieces has such gentle, calm and soothing energy about it. You packed it with love and care. I received it with joy and gratitude.